When a tornado with 120 mile-per-hour winds tore through northwestern Wisconsin Tuesday, it took two lives and destroyed dozens of homes. One of the destroyed mobile homes belonged to Ron Belcher of Prairie Lake Estates. He was home with the two dogs he considers his children, Cocoa the Husky and Taz the Pomeranian, when the EF2 tornado struck. Belcher was knocked unconscious by a collapsing wall. When he woke up, his home was in shambles and, most importantly, Cocoa and Taz were nowhere to be found. He feared the worst. Emergency responders found Belcher and took him to a hospital, where he was treated for several broken bones, cuts and a head injury. As Belcher recovered, a wonderful Marshfield Clinic nurse named Ciara Rockow took it upon herself to go looking for Cocoa and Taz. Her kind efforts quickly paid off. She found both of them, alive and well, at the Animal Hospital of Chetek. 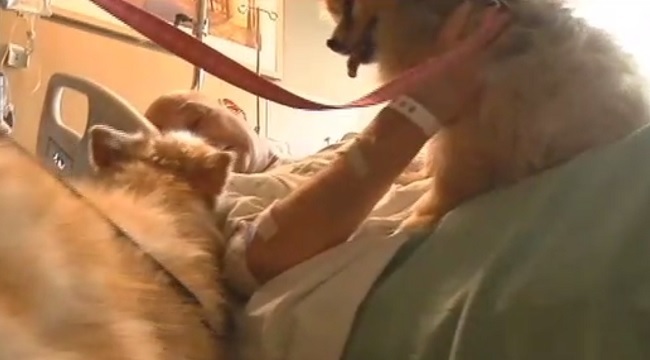 Two days after Belcher thought he’d lost his dogs forever, hospital staff brought Cocoa and Taz to his bed. “This is God’s gift, that’s what keeps me moving no matter how many bad things happen,” Belcher, whose recovery is expected to take six to eight weeks, told WQOW. Their happy reunion was caught on video — grab a tissue or 10! If Marshfield Clinic has a Nurse of the Year award, here’s hoping it’s bestowed upon Rockow. Also deserving plenty of accolades are all the people who generously donated much-needed supplies to the Animal Hospital of Chetek. The hospital is caring for displaced pets free of charge. If you want to help, according to the hospital the best way is to make a donation to the Humane Society of Barron County or to the Veterinary Care Foundation (select Wisconsin and Animal Hospital of Chetek).